When growing rosemary, your climate will dictate whether to plant it in the ground or in a container. Rosemary is a perennial, and it will grow for several years. In warm climates with mild winter seasons, rosemary can be planted in the ground. It will thrive for several years and become quite large. In cooler climates with freezing winter temperatures, rosemary is better grown in a container that can be brought inside during the cold winter months. Rosemary is easy to plant, simple to take of and even easier to harvest. It can be used in a wide variety of recipes to season meat, poultry, fish, vegetables and even in drinks and desserts. 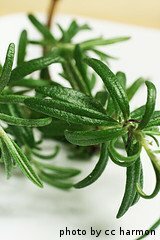 Rosemary does best when grown in full sun, although plants will tolerate partial shade. If you are growing your rosemary in a container, it can easily be moved to where it can get the most sun. It takes a year or so for a typical rosemary plant to really take off. During the first year of growth, few sprigs are available for harvest. 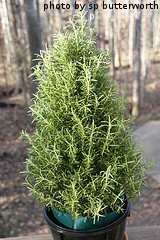 Mature rosemary plants resemble an evergreen shrub with short, edible needles. In warmer climates, rosemary plants can be used to create a hedge row. They can reach 4-5 feet tall and can even be trained and trimmed into topiary shapes. When cultivating rosemary, it's best to keep mature plants trimmed so that the sprigs and stems don't get too woody. Rosemary plants are unique in that they are very tolerant of salt spray, making them ideally suited for growing near the ocean. When harvesting rosemary, take only what you think you'll need at the time and leave the rest on the plant. This will keep it healthy and vibrant for months or years to come. After harvest, rosemary stems can be stripped of the needles and used in whatever recipe you want. If you need to harvest the whole plant and store the herb for later use, the sprigs can easily be dried. Dried rosemary needles don't taste as good as fresh, but they'll do in a pinch and last a long time in an airtight container or bag.